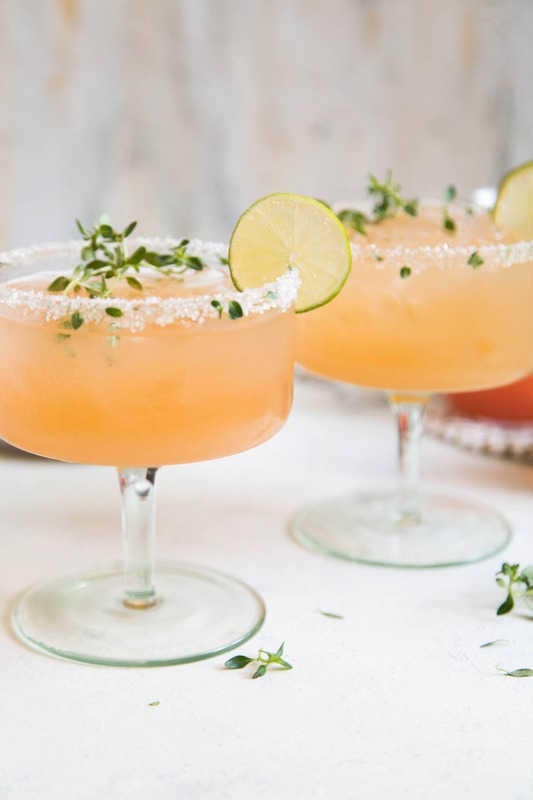 This honey thyme margarita is made with fresh squeezed juices and thyme infused honey. I’ll take any excuse to make a margarita. Once upon a time, I avoided tequila like the plague. One too many nights of tequila shots in college resulting in headaches and hangovers led to my distain for the liquor. Now that I’m a tiny bit wiser and into my 30’s I have come to appreciate tequila’s flavor, aroma, and versatility. 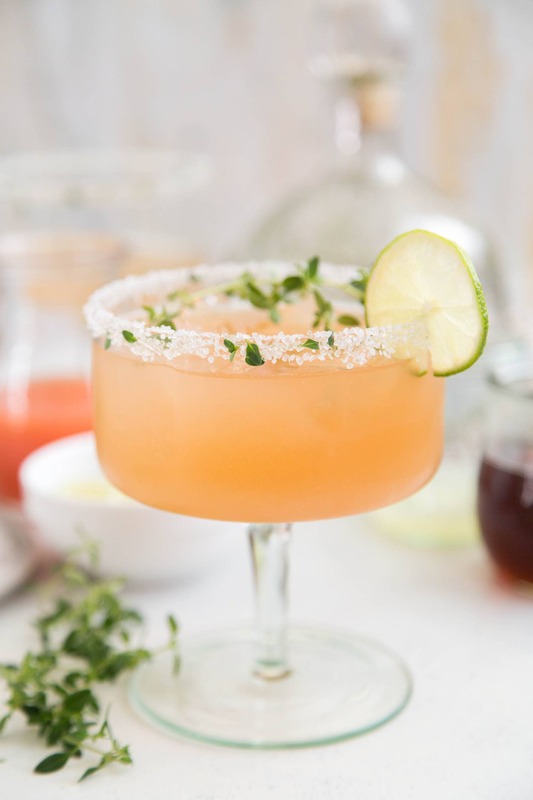 This honey thyme margarita recipe uses blanco tequila. This is a personal preference. I tend to use blanco for all my tequila based cocktails. I reserve the aged tequila for sipping neat or enjoying on the rocks. 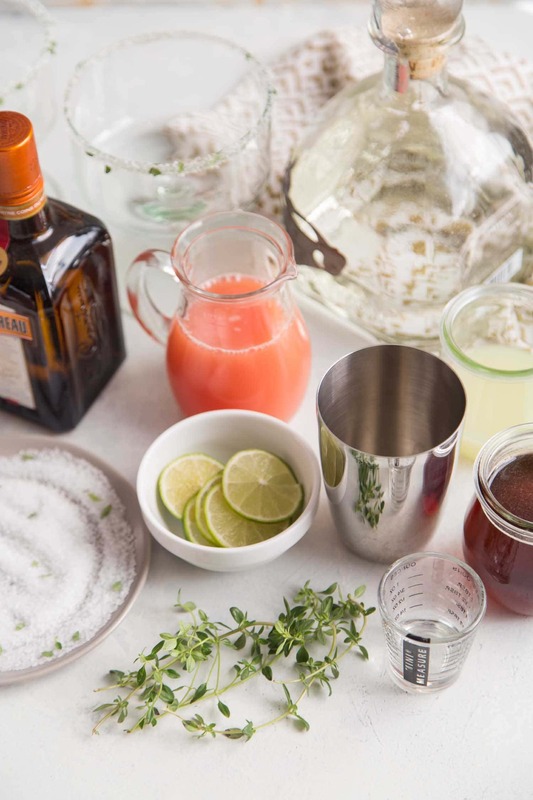 The strong forward flavors of silver tequila pair wonderfully with citrus. 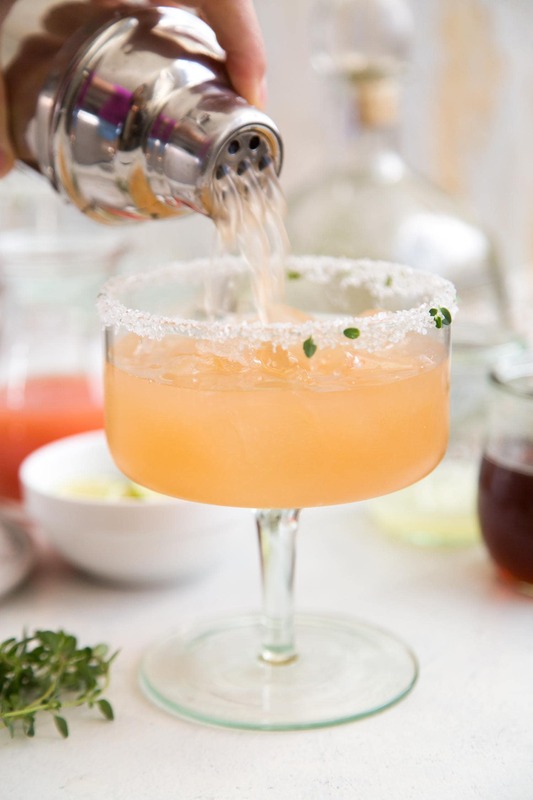 Be it lemon, lime, orange, or grapefruit- it’s a friend to tequila. 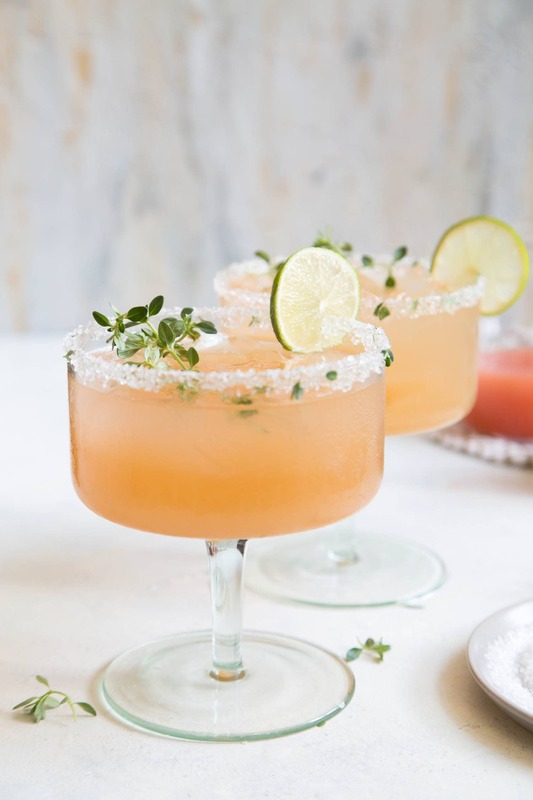 This cocktail uses a combination of grapefruit and lime juice. The slight bitterness of the grapefruit works well with the earthy honey thyme syrup. Fresh squeezed lime juice and a touch of orange liquor help to soften the cocktail, making this drink super refreshing and easy to drink! The honey thyme syrup is made by combing equal parts liquid honey and water. 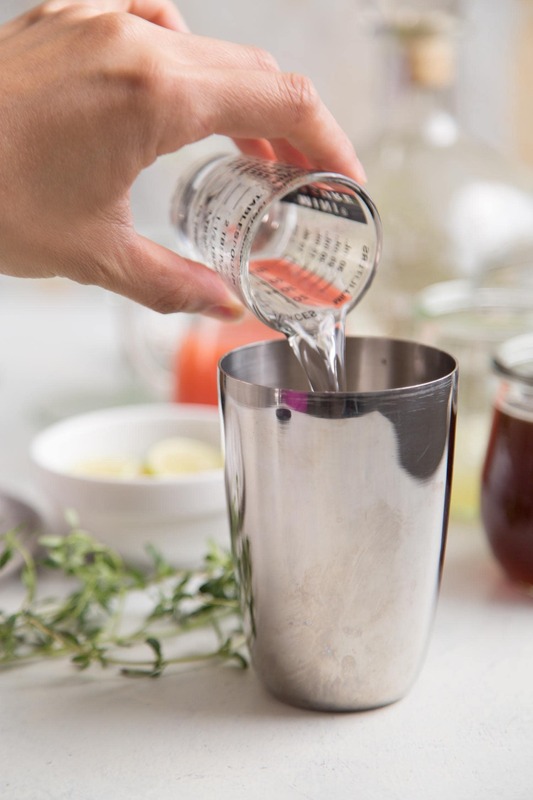 Fresh thyme sprigs are steeped in the sweet mixture until the desired flavors are extracted. There are many, many different types and varieties of honey. Asides from whether you are using raw or pasteurized (processed) honey, honey varieties depend on the flowers the bees used. Some varieties are stronger in flavor, some are sweeter, some are darker in color. I suggest using a mild, light flavored honey. This will allow the thyme to shine through. If you use a dark hued, strong flavored honey, the herb will be lost. Use Alfalfa, Clover, or Orange Blossom honey for the best results. Fill cocktail shaker with ice. Add tequila, lime juice, grapefruit juice, orange liqueur, and syrup. Shake well until well chilled. Strain into a salt-rimmed serving glass. Add water, honey, and thyme to a heavy bottomed sauce pot. Bring to a simmer until honey has dissolved. Remove from heat and let thyme steep for 30 minutes. Strain out thyme. Transfer syrup to airtight container and keep at room temperature. I suggest using a mild, light flavored honey. This will allow the thyme to shine through. If you use a dark hued, strong flavored honey, the herb will be lost. Use Alfalfa, Clover, or Orange Blossom honey for the best results. I can’t remember whether I purchased them from Crate & Barrel or CB2.